Contemporary insurance companies deal with an increasing magnitude of video and digital media. In the insurance industry, video takes the form of vital business functions like video evidence that supports insurance claims or video-based training for insurance agents, as well as new and crucial new technologies like drone video streaming. Additionally, video is also used as a powerful medium for corporate communication and marketing activities. However, the insurance industry’s increasing reliance on video hasn’t been without its challenges. From auto insurance to property and casualty insurance (P&C) to business and employee insurance, all claims generate video evidence. Insurance inspectors, for instance, travel from one incident site to another, collecting video and other digital media evidence, but are unable to process and share the evidence with adjusters for speedier processing while they are on-to-go. Moreover, with inspectors amassing large volumes of video every day, the storage of such video become highly problematic. Traditional insurance case management tools are not designed to support video capture from different file formats or video streaming, storage, and quality playback. Moreover, insurers now also receive videos from policyholders who record incidents or damages on video for insurers to assess as part of their claims. Often, these videos come in varying or even proprietary formats, which can be challenging to ingest in case management systems for storage and playback. With increasing competition within the industry, insurers are also under pressure to deliver faster claims processing, while also maintaining accuracy to avoid paying more or less than what’s required. Adding to this dilemma is the incorporation of more sophisticated video use cases such as drone video streaming, which generates lengthy video footage, requires complex processing, is often incompatible with the existing CMS, and is now also required for live streaming in case of mass casualty situations for more efficient processing. Additionally, with increasing pressures to digitize business operations and reduce costs, insurance companies are also opting for video-based business functions such as training, corporate communication, and marketing. However, all of these video-based services are extremely difficult for insurance companies to administer without an enterprise-grade streaming video solution that supports end-to-end video capture, storage, processing, sharing, and management in a secure video platform that integrates with existing line of business applications. To resolve this, VIDIZMO offers a comprehensive video platform that enables video streaming and digital content management that addresses all insurance video use cases, and digital media needs and challenges. Optimize speed and accuracy of claim processing: Insurance agents generate a great deal of video and pictorial evidence as they conduct inspections across their areas of expertise. Following this, claims processing time and accuracy often depends on how quickly an agent can inspect more objects in less time, which requires maximal evidence collection and speedy evidence processing. To do this, VIDIZMO lets agents do fast upload of evidence on-the-go, from any media capturing device or directly from VIDIZMO smartphone app, available on both iPhones and Androids. All evidence is logged in VIDIZMO’s infinitely scalable media storage repository from where it can be reviewed and assessed by the respective adjusters. Moreover, with ease of media upload, on-site agents are free to collect as much evidence as they need without having to worry about concerns regarding bandwidth, network availability, media upload, or media storage – all of which is enabled and optimized by VIDIZMO. Not only this, but VIDIZMO can also have a dedicated channel for policyholders, who can be given authorized access to submit their videos or photos from incidents for the adjusters to review. The end result is a speedier and more accurate claims process, increased agent efficiency, and satisfied customers. Additionally, VIDIZMO offers cognitive insights from AI services such as facial and object recognition, which produces metadata that further speeds up evidence processing and provides valuable data to help insurers make more accurate claim assessments. Improve and streamline the training process for agents, inspectors, and claims investigators: Streaming video is one of the most effective tools for improving the on boarding process for newcomers. Leading insurance companies now facilitate newly hired agents with self-paced training videos that can help them learn and absorb knowledge about various information-intensive insurance products or selling how-to's. With VIDIZMO’s media platform, trainers can also embed other interactive media such as quizzes within their training videos to increase trainee engagement, retention and recall. Moreover, senior insurance inspectors or claims investigators can also use video to demonstrate real-time field situations and experiences as they conduct inspections and stream it live for their junior colleagues to follow, learn ask questions through live chat, and receive answers in real time. As a result of such video-based training activities, junior agents, inspectors, and investigators learn faster and are ready to join the team of experienced professionals sooner. All this while, insurance companies save cost and resources that would be otherwise spent on on-site training or traveling. Draft more accurate policies and reduce claims leakage: Inaccurate claims are a long-standing concern for insurance carriers, who suffer tremendous profitability losses as a result. However, with ease of documenting evidence such as videos, pictures and other rich documentation in a centralized video portal such as VIDIZMO, insurers have easy access to a lot more data to devise policies with greater accuracy. For instance, with detailed video footage, P&C policies can be written with a better understanding of the insured property, which in turn helps manage front-end risks. For claims, the more visual evidence is available from an incident, the more accurately adjusters can assess damages and the accuracy of the claim to determine the right settlement the first time, no more and no less – which helps counter claims leakage, fraud, human errors, and other sources of inaccuracies. Not only this, but centralized access to all media can also help insurers better analyze trends which actuaries can use to develop better projections and other applicable industry standards. Incorporate new-age drone video streaming technologies: From remote site inspections to fly-over property appraisals, drone video streaming holds immense potential to revitalize and transform fundamental business functions in the insurance industry. However, drones being a nascent technology in the enterprise, many firms are not technically equipped to capture, stream, store, and manage drone video in an efficient and consolidated manner to use its video output in day-to-day business operations. To resolve all such challenges, VIDIZMO’s video platform is equipped to handle all types of drone video. VIDIZMO supports live and on-demand drone video streaming from any drone device, regardless of bandwidth or network conditions. For details on VIDIZMO’s drone video streaming capabilities, see our blog on drone video capture, live streaming, and management in VIDIZMO’s streaming video platform. 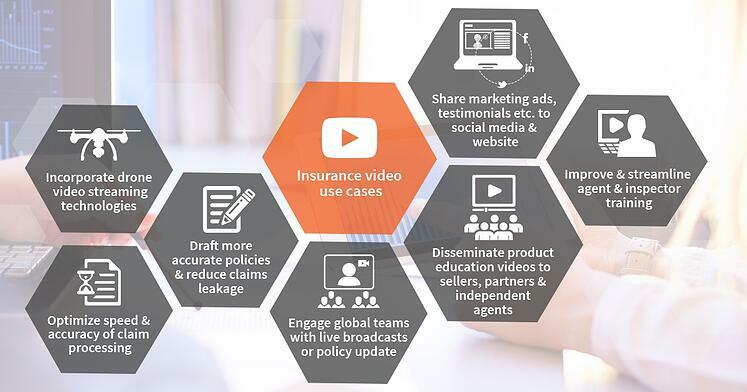 Disseminate product education videos to sellers, partners or independent agents: Insurance products are complicated and require a great deal of orientation and understanding before insurance sellers, partners, or independent agents can start promoting them to customers. With VIDIZMO, product teams or subject matter experts can simply record such videos and distribute them to all sellers from one portal. The company’s own sellers can access the material from their VIDIZMO portal, or the videos could be shared from VIDIZMO to corporate social networks such as Yammer or Slack. External partners, resellers or independent agents, on the other hand, can be given third-party access through a dedicated channel for external stakeholders. Alternatively, any external users can also be provided a temporary or permanent link to any relevant videos for quick viewing. Share marketing ads, customer testimonials & educational videos via social media channels & website: Most insurance companies have a lot of digital promotional ads, customer testimonials, and customer education videos, among other marketing content, which they now need to distribute to the company’s website and various social media channels. VIDIZMO provides a centralized and structured approach to storing all media in a single repository and manages the distribution of all media to various corporate social platforms, in the required video quality and file formats. For example, insurance companies can use VIDIZMO to share their product education videos, customer testimonial ads, or customer awareness campaign media to the company’s website and social media outlets to make the videos accessible to all their digital audience, which includes current and prospective customers, as well as other stakeholder groups. Engage global or nationwide teams with live executive broadcasts or policy update announcements: A strong internal communication strategy is vital to keeping employees motivated and connected to a company’s purpose, value, and mission. With VIDIZMO, CEOs or other executives can easily conduct live or on-demand video streamed broadcasts to address employees at all levels of the company, in any geographical region. Additionally, live or on-demand video broadcasts can also be used to instantaneously communicate all company-wide announcements, policy revisions, regulatory changes, and much more. Within VIDIZMO’s video portal, all employees can watch the video in real time from any device or browser, regardless of their time zones or bandwidth conditions. For policy update announcements, VIDIZMO can also be used to give third-party portal access to partners, third-party sellers or independent agents so they can also keep up with any policy or regulatory updates and internal announcements that they may need to align with their selling or promotional strategies. For more on VIDIZMO features and functionalities that support insurance video use cases, refer to our blog How a video streaming platform enables insurance video strategy or contact us to find out how VIDIZMO can help your insurance company execute its video and digital media strategy.